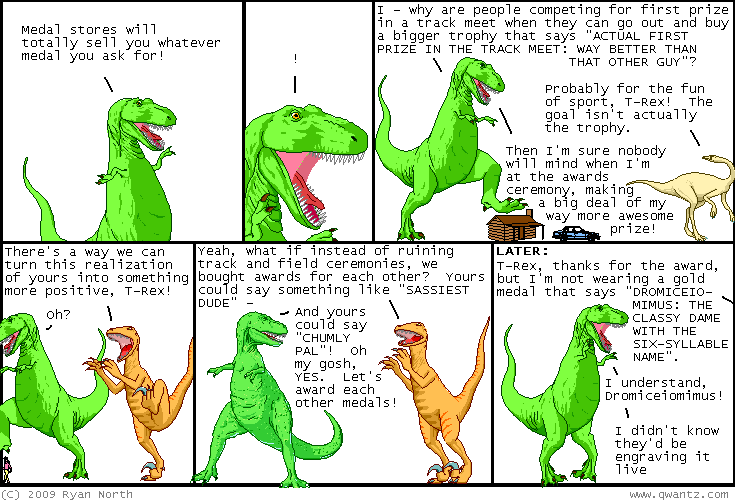 Dinosaur Comics - September 8th, 2009 - awesome fun times! –Who in turn, logically, must borrow it from THEIR children too! September 8th, 2009: In Toronto (as in most cities that don't enforce advertising laws effectively) lots of public signage is covered with ads for entirely sketchy companies, so one afternoon a few weeks ago I carved a T-Rex relief and made some of my own sketchy stickers that I put up, covering their phone numbers. I forgot T-Rex's arms and his line of dialogue (I believe it was going to be, "hey"), but because the whole thing looks like a caveman made it anyway, I still think it works! One year ago today: oh, did i say "memorable"? I meant "difficult".